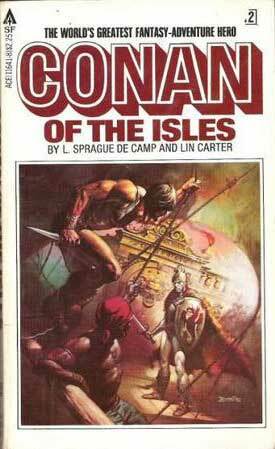 Conan of the Isles, by by L. Sprague de Camp, Lin Carter, was first published in 1968 and is the last book (book 12) of the "original" Conan series. Conan has been ruling Aquilonia for some twenty years, and has consolidated his power and neutered his enemies. Aquilonia has flourished under his rule and Conan finds himself tired of the life of a king and nostalgic for his old days of adventuring. His wife Zenobia is dead, having passed in childbirth, and his oldest son, Conn, is now twenty years of age. When Aquilonia comes under attack from mysterious "red shadows", sorcerous apparitions that appear to be kidnapping his subject, Conan receives a vision from the mage Epemitreus who tells him he must abdicate his throne and head west, past the horizon, to an unknown land where descendants of Atlantic still ply elder sorceries. The hunger of the god the Atlanteans worships is growing and could eventually threaten to engulf the world. So Conan passes his crown to his son and begins his last recorded adventure. With the help of Sigurd Redbeard, a comrade from Conan's old days as a pirate, he secures a ship and sails into the unknown West. Conan has no intention of dying of old age in a bed surrounded by grandchildren. Now in his 60s, Conan isn't the figure of physical prowess he used to be, although his strength and stamina are still superhuman. Carter and de Camp had been around Conan enough by the time they wrote this that they understand what it takes to deliver a Conan tale. Given that I am now less than a month from turning 50, this tale resonates much more woth me know than it did when I first read it as a skinny thirteen year-old. I realize it has no bearing on me or my life, but reading about a 60-ish Conan who is still vital and more than willing to fight is kind of inspiring. The ending leaves the door open for further adventures, but although I've read my share of Conan stories, I don't recall another one feature Grandpa Conan. There's a ton of Conan stuff out there, but I think the best and truest are the original 12 books first published in the 1960s. Well worth a revisit, or a first-time read if you've yet to have the pleasure.